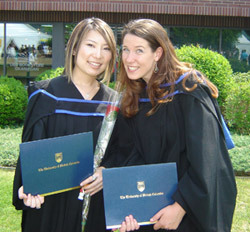 Mari Tanaka, left, and Lindsay Balfour are among the first graduates of UBC Okanagan's Cultural Studies major program. From managing an English-speaking theatre company in Montreal to presenting papers at prestigious conferences half way around the world, the first graduates of the Cultural Studies program at UBC Okanagan are already making their mark. Though the program is just two years old, several students fulfilled all requirements to graduate this month with a Bachelor of Arts, majoring in Cultural Studies. Graduate Mari Tanaka is looking forward to having her first short essay published. Titled "The Inherited Legacy: As a hyphen Canadian," it will appear in Response, Responsibility, and Renewal: Canada's Truth and Reconciliation Journey -- the second volume in a series of resource books put together by the Aboriginal Healing Foundation for the Truth and Reconciliation Commission. "It really is an amazing honour and a humbling experience to have my voice included in something like this," says Tanaka, who plans to continue her studies this fall in the interdisciplinary graduate studies program at UBC Okanagan. "All my professors in my program were incredibly supportive," she says. "They were always there to guide me, to give me advice, or to talk about my ideas. Their office doors were always open to let me vent, or just to chat. I am so thankful to each and every one of them for my undergraduate experience here." Fellow graduate Rivkah Sherman has accepted a position as the manager of a small English-speaking theatre in Montreal. Lindsay Balfour, another Cultural Studies 2009 graduate, is off to Dublin this summer to deliver her paper Looking Saddam in the Eye: Emergent technologies and the ethics of visual confrontation at the prestigious Photography and International Conflict conference, before starting her master's program at UBC Okanagan in September. "I take great pride in these recent graduates and I'm incredibly pleased that two are accepted into graduate studies and are attending national conferences and getting published, while another is launching into theatre management," says Daniel Keyes, Chair of the Cultural Studies program. "These students have a fine and lively sense of community. Despite Cultural Studies being a new major, I was heartened by these students' combination of intellectual curiosity, activism and fun. I have never taught a Friday afternoon class where a student arrives with a box of cupcakes for the class." The Cultural Studies program of the Faculty of Creative and Critical Studies is designed to enhance students' critical thinking and writing skills, Keyes notes. Because Cultural Studies is interdisciplinary in nature, it strengthens skills in qualitative and quantitative analysis while providing a focus on critical theory, globalization, and media.